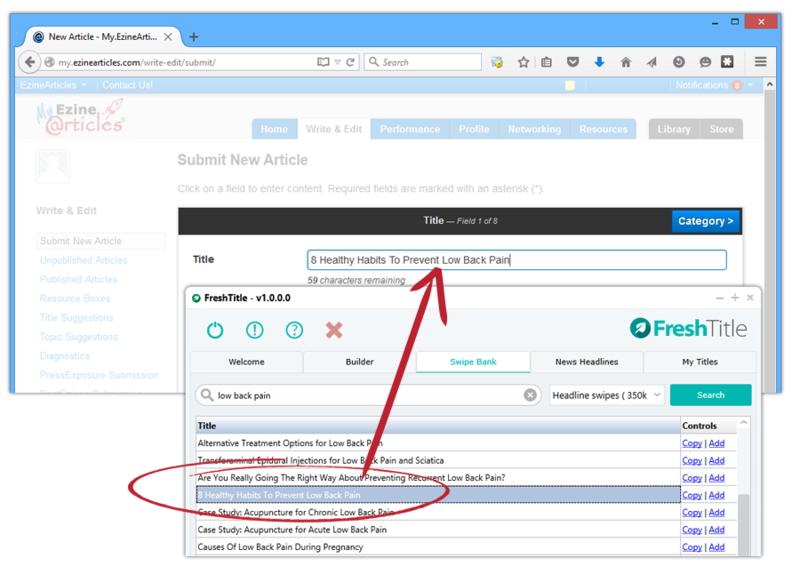 Quickly generate over 830 powerful & proven titles or headlines by answering a few simple questions about your product, service, or subject! Get instant access to over 350,000 proven headlines and over 70,000 email subject lines for an endless source of content ideas! 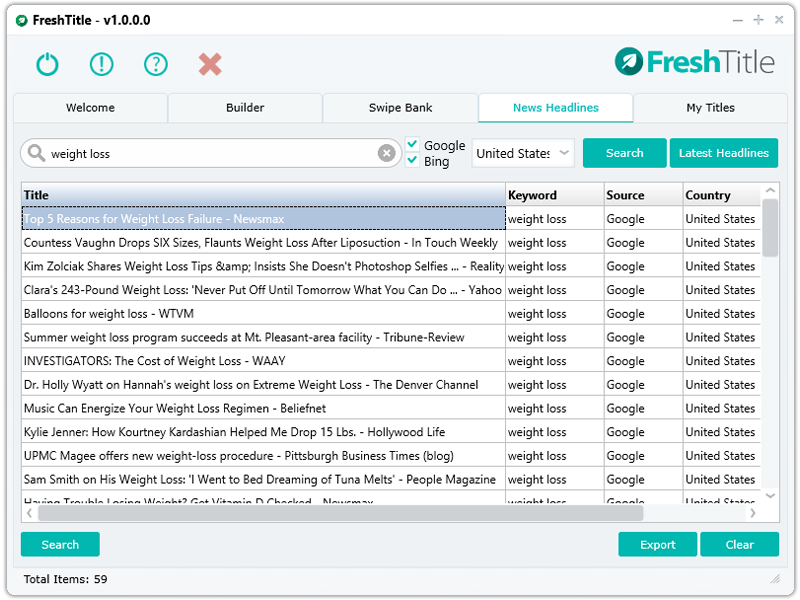 Search the latest news headlines by keyword from Google and Bing for instant fresh new ideas for your content! In a hurry? We got you covered, simply click the "Latest Headlines" for the latest top news headlines! 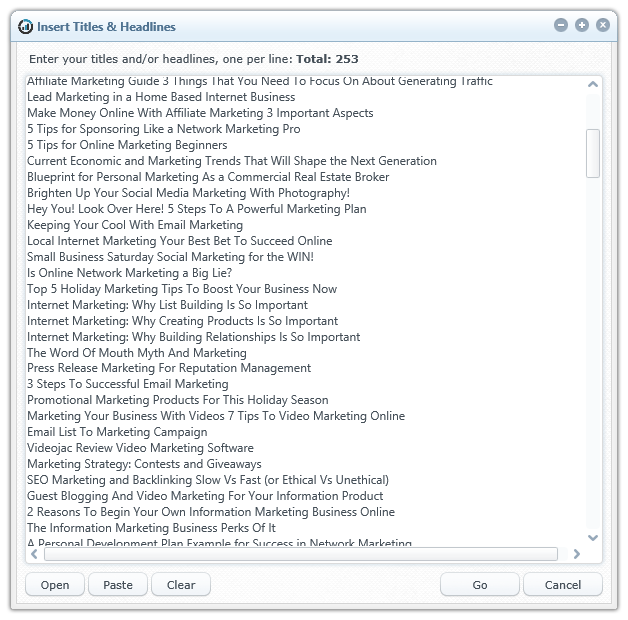 Save all your best titles & headlines in your own personal database. 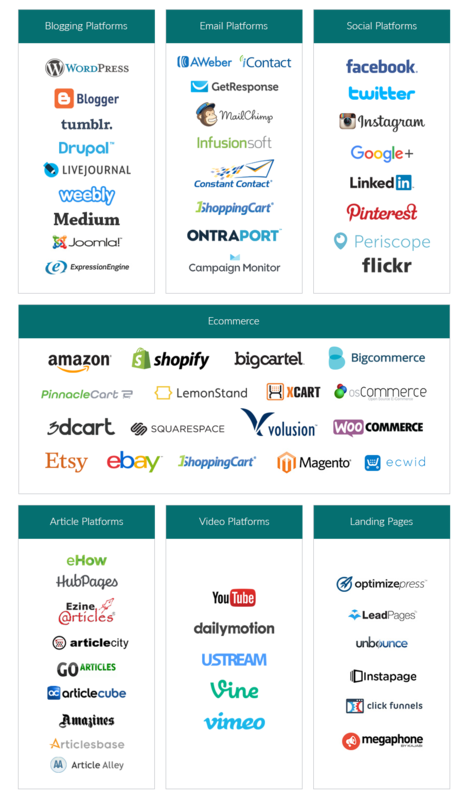 You can even rate and categorize your content! 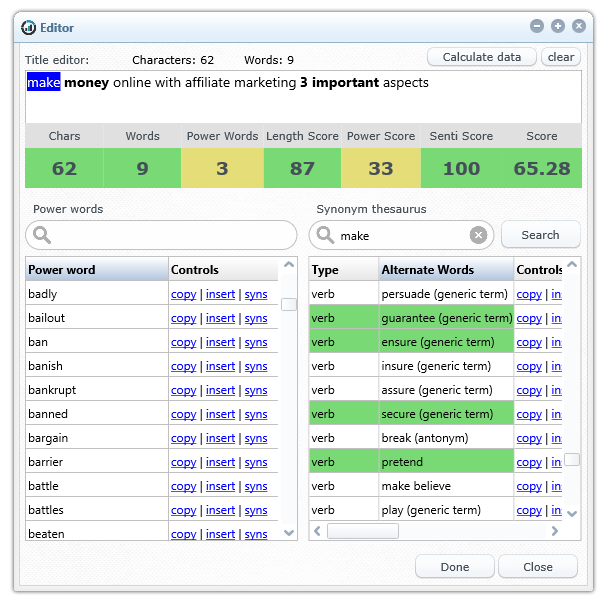 Plus, quickly swap out words for synonyms using the built-in thesaurus for fresh unique content in a flash! Need Quick Edits for Fresh Unique Content? 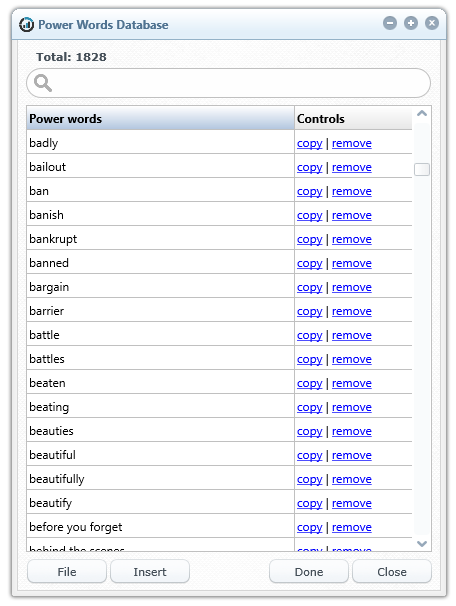 Use the Built-In Thesaurus to Instantly Swap out Synonym Words in a Flash! Use Fresh Title for ANY Content You Need! 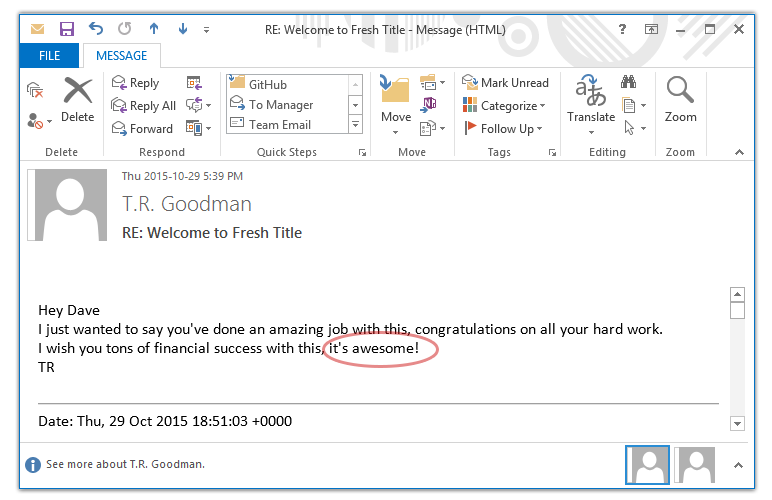 Quickly crank out amazingly powerful titles for your blog posts! 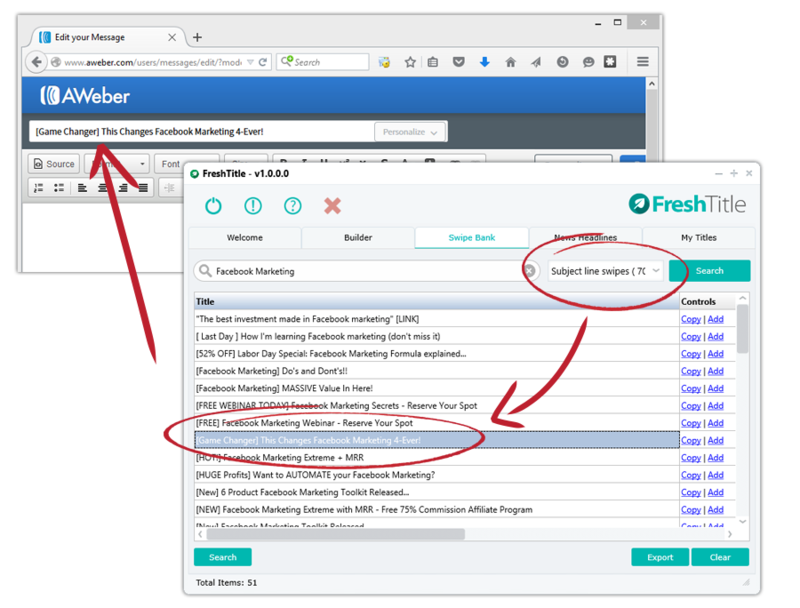 Also, use Fresh Title to generate "traffic-getting" headlines and sub-headlines for your post or blog page content! 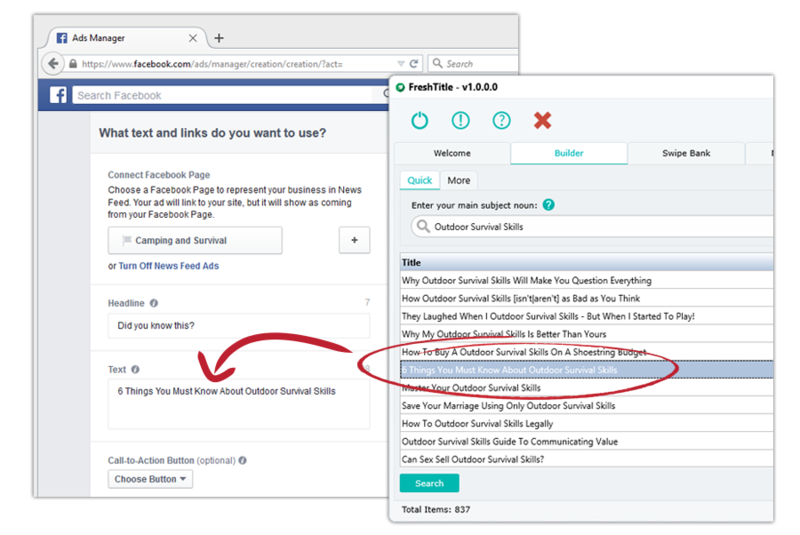 Are you stuck thinking of a powerful Facebook ad title or description? Think no more and let Fresh Title hand over all the best titles & headlines you need! Plus, you get endless ideas for post content and post titles! In a hurry and desperately need a powerful email subject line for your next product or affiliate promotion? We got you covered .. BIG TIME! 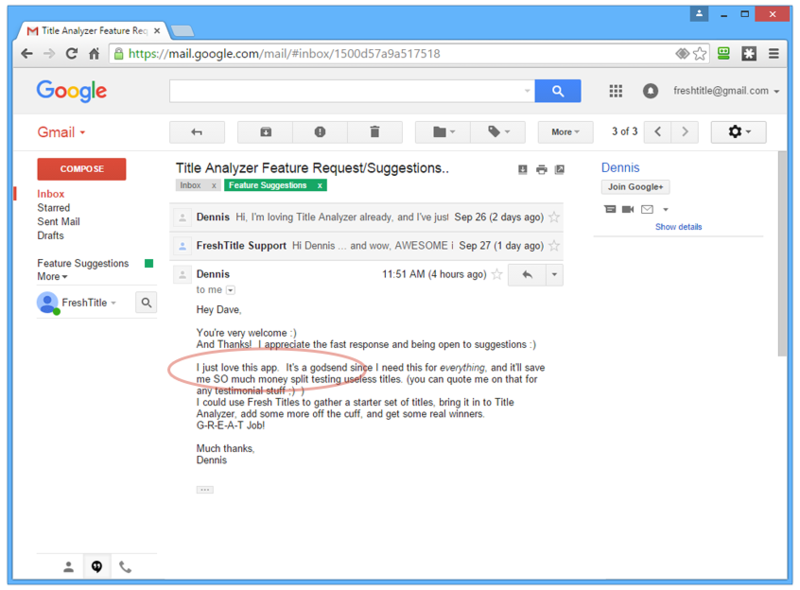 Use the built-in 75,000+ internal database of email subject lines to come up with hundreds of ideas! Or use the internal database of 350,000+ proven headlines! With just one-click you can pump out tons of headlines for any niche you want! Having a powerful video title on Youtube can make or break your success. 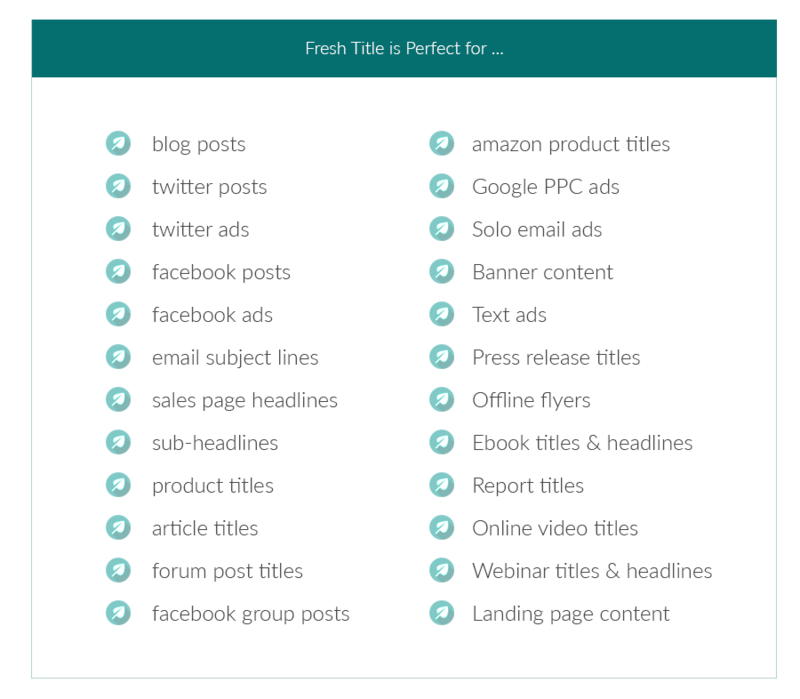 Use Fresh Title to get the perfect title and headlines you need for maximum video engagement! 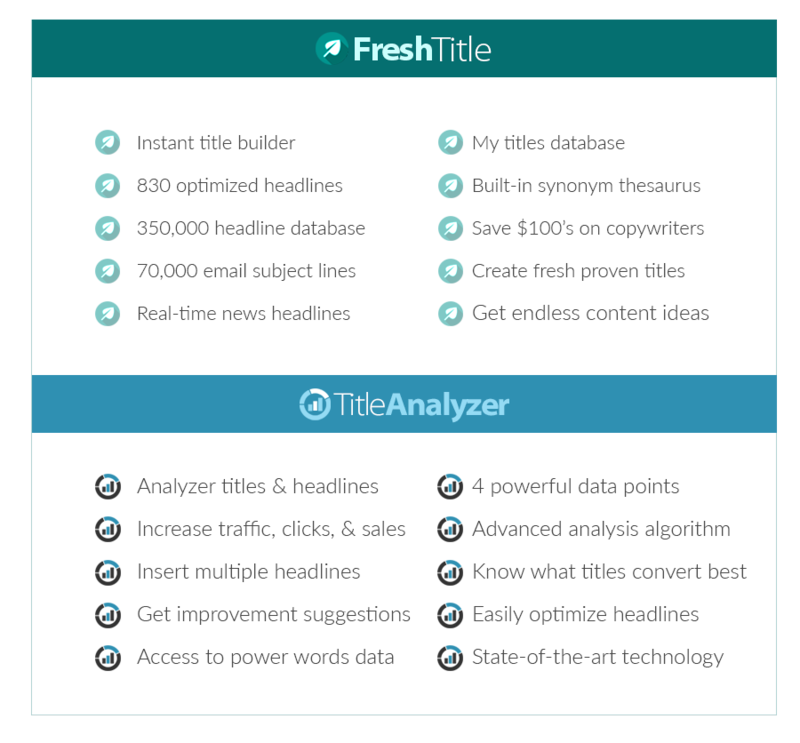 Fresh Title can not only generate your titles & headlines, but you can also use the massive internal databases of over 425,000+ headlines & email subject lines to brainstorm new ideas for article topics! 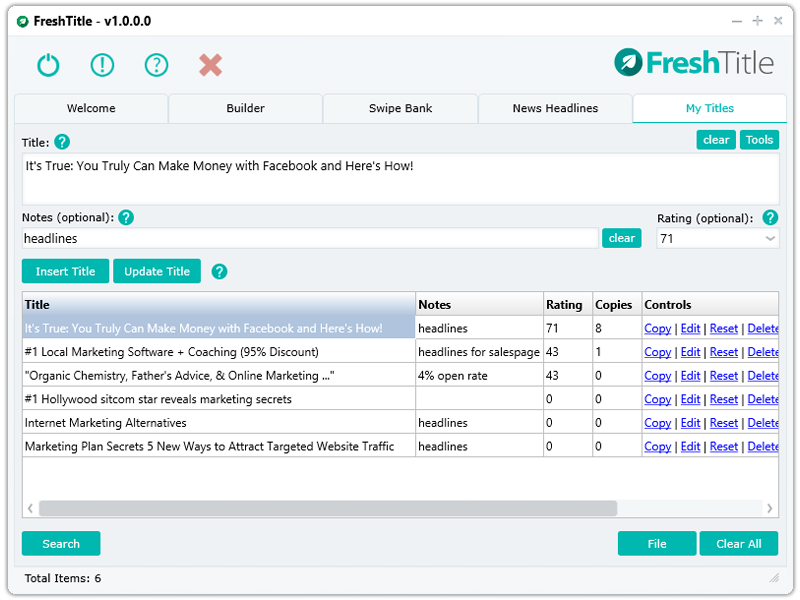 PLUS .. for a limited time get the following revolutionary title analysis software ..
Instantly Know Exactly Which Title or Headline Will Bring in More Traffic, Clicks, & Conversions! The internal analysis algorithm uses 4 separate methods to calculate the overall performance score for each headline you enter! It's like having a crystal ball in the palm of your hands .. that actually works! Insert as many titles or headlines as you want! This powerful software will analyze as many as you can throw at it! Plus, you don't require an internet connection to analyze your titles .. therefore, avoid memory hogging internet delays! We didn't stop there! 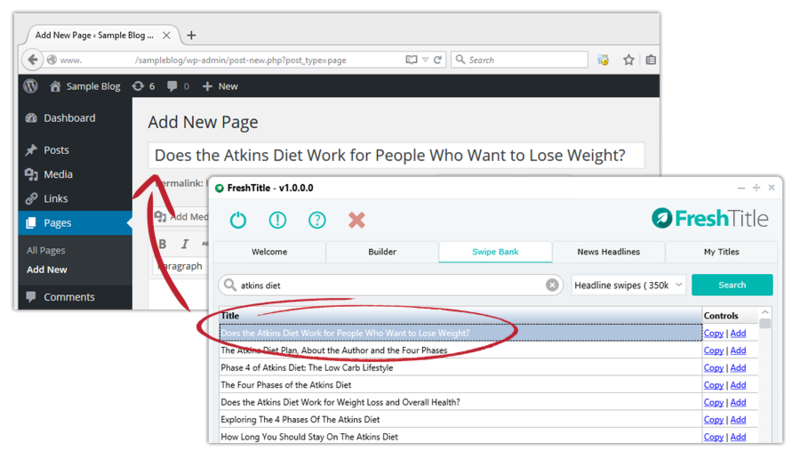 Title Analyzer will not only score your headlines, but provide detailed suggestions on how to IMPROVE your headlines even more! 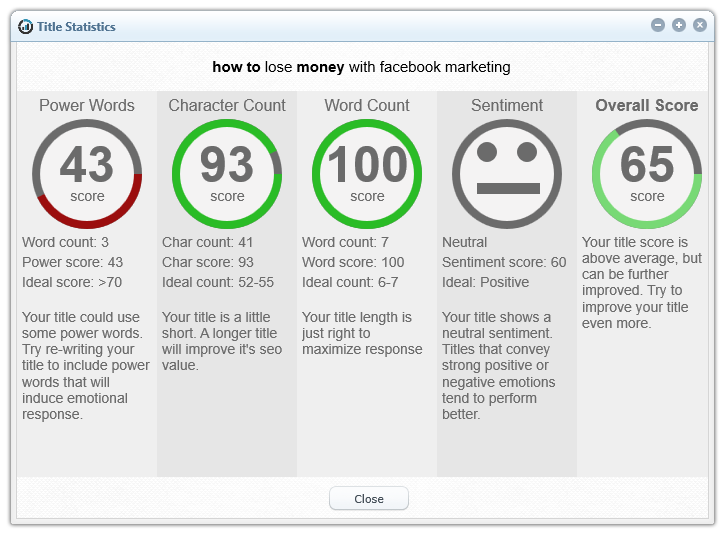 The internal algorithm uses 1,828 power words for strategically calculating the overall performance score of your titles. You can insert or remove any power words you want to personalize the score for your specific needs! From our research, this is the largest set of "emotional power words" collected into one database! 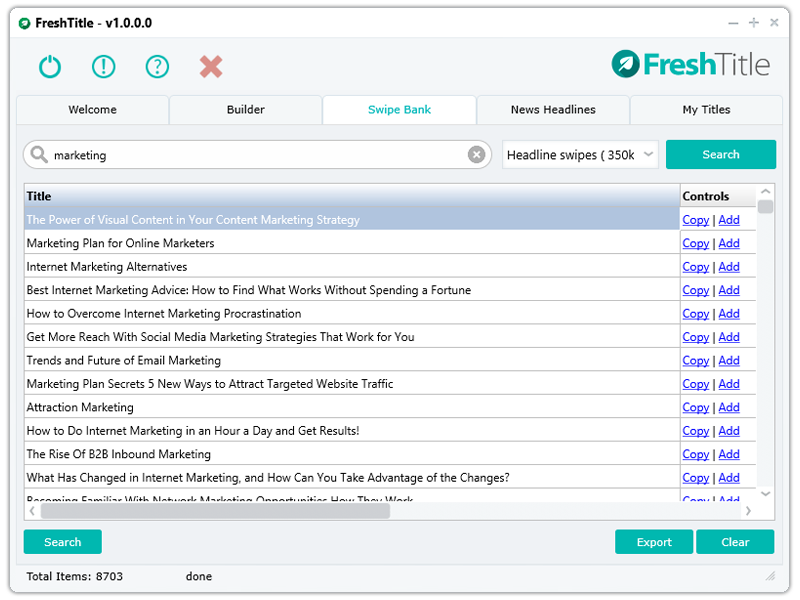 You also get another built-in editor tool for quickly optimizing your headlines. This sophisticated editor instantly reveals the color-coded statistical data while you are editing! 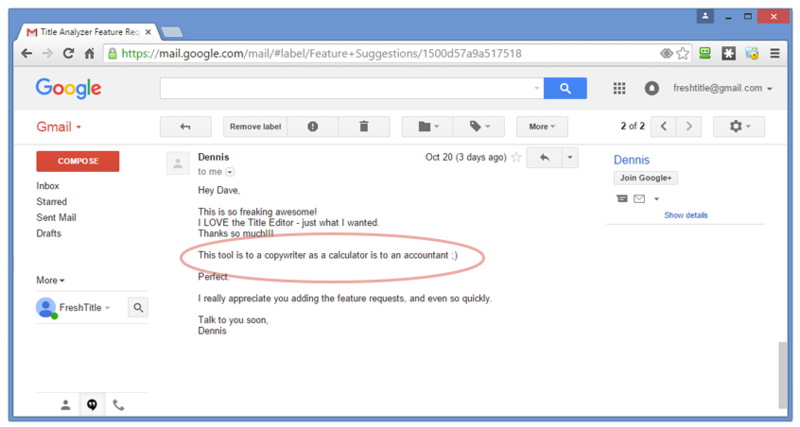 "This Tool is to a Copywriter as a Calculator is to an Accountant!" 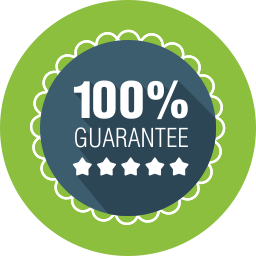 Your purchase comes with a full 100% money back guarantee. If for any reason, you are not satisfied with your purchase, we will refund all your money back with no questions asked. Simply put, we don't deserve to accept your money unless you are completely satisfied with the product. We are taking all the risk for you and you have nothing to lose! 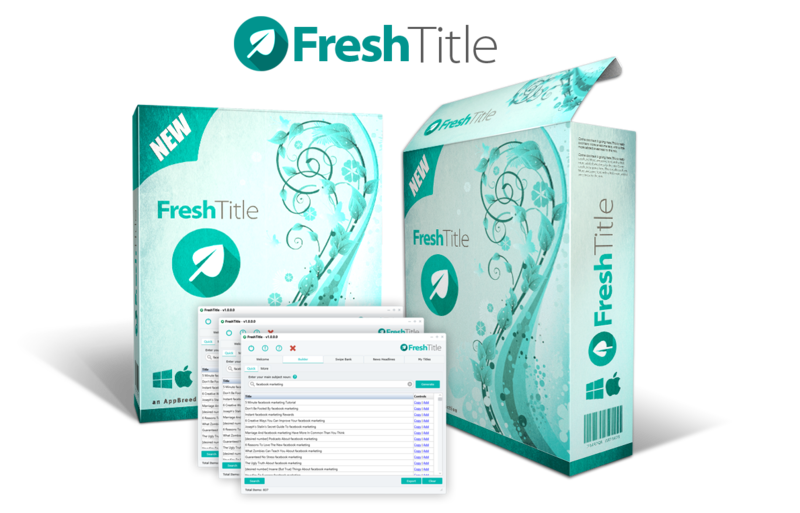 Get the brand new Fresh Title package today! 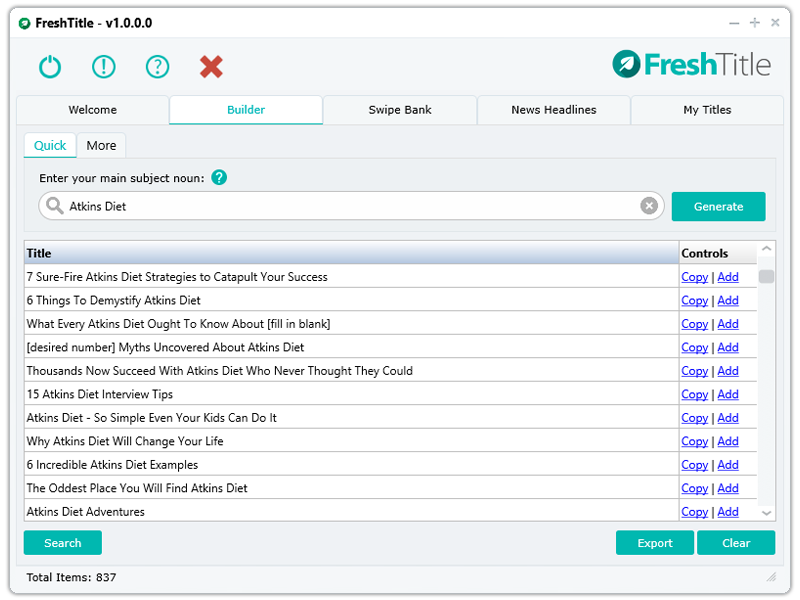 Grab Your Copy of Fresh Title and Get the Bonus "Title Analyzer" Absolutely FREE! 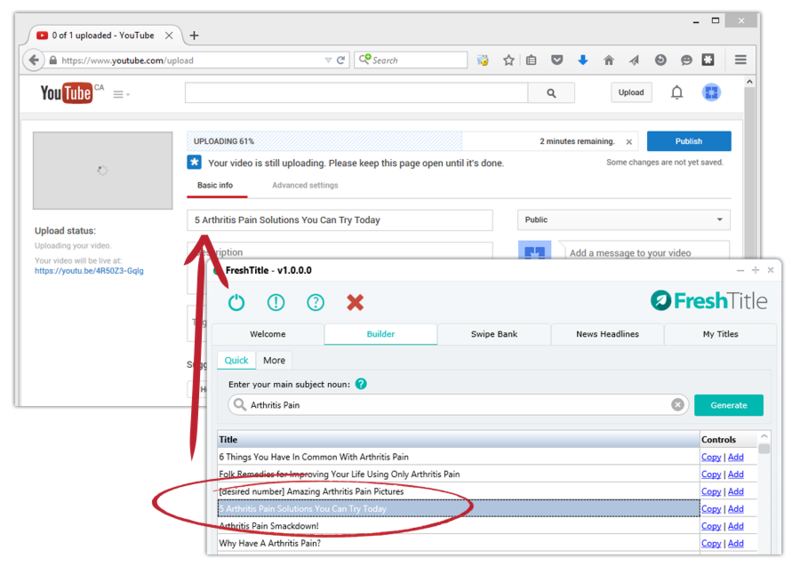 Remember, you are arming yourself with the ultimate shortcut to traffic-getting titles & headlines for any type of content you can need! You Need to Act Fast, Because this Offer Won't Last! This special low price is only available during our launch period, and once it ends, we will be raising the price for this one-of-a-kind software package. Ask yourself, "Am I really going to stand still and watch my competition steal all my well-deserved traffic from under my nose?" Do you really want all the hard work you put into your business to fall apart all because of a few bad converting headlines? 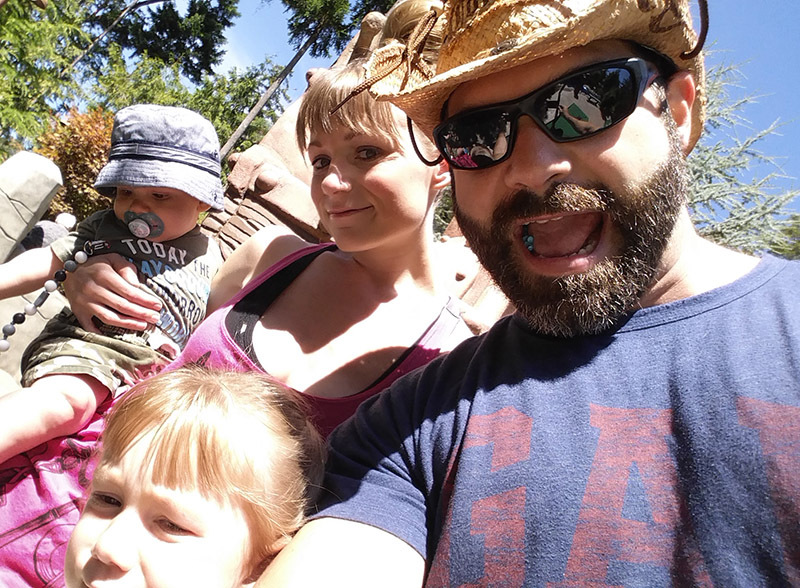 Seriously, don't let your competition come in and scoop your traffic, subscribers, and sales .. you can END this today! 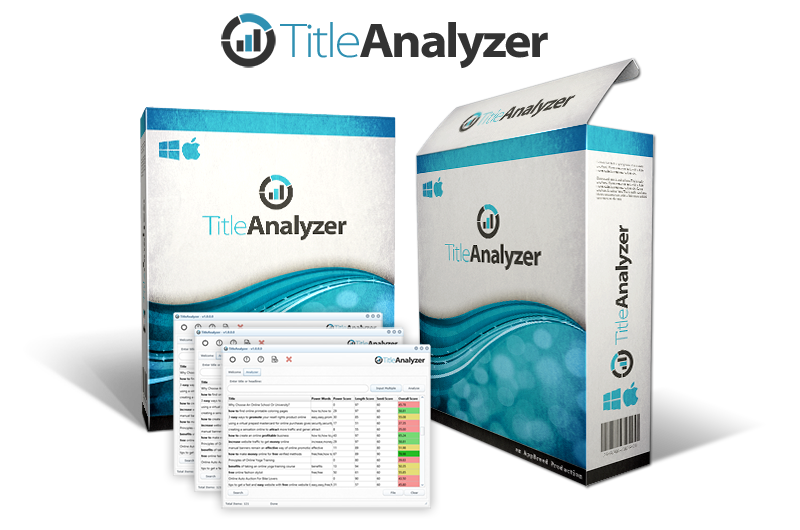 Order now and get instant access to Fresh Title & Title Analyzer - the world's most powerful title creator and title analyzing software for content marketers! ... and you never have to worry about losing traffic to your competition! 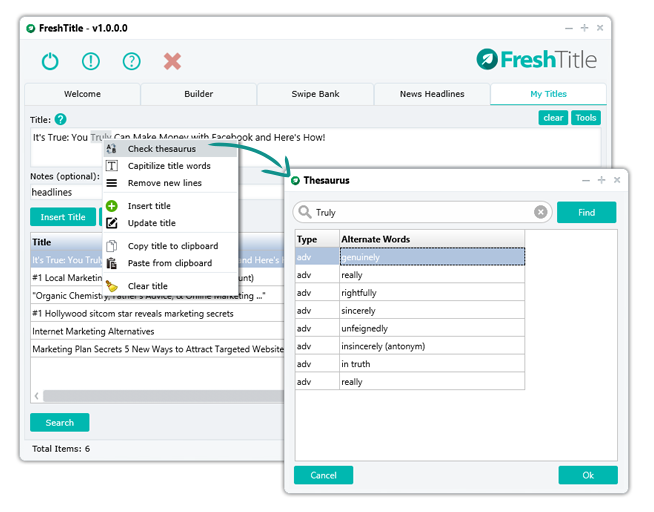 Yes, both the Fresh Title and Title Analyzer software work on Mac computers. In fact, we will provide a completely native Mac application that doesn't rely on the Adobe AIR platform. Yes, you will get all future minor version updates that include new features. Major version updates usually occur every few years and in some circumstances may require an additional fee. For example, if a new added feature requires a steady stream of monthly content to operate, therefore, in that case, an additional fee is required to maintain a healthy system & cover operating costs. All current customers will automatically qualify for a discount on all future major version releases. 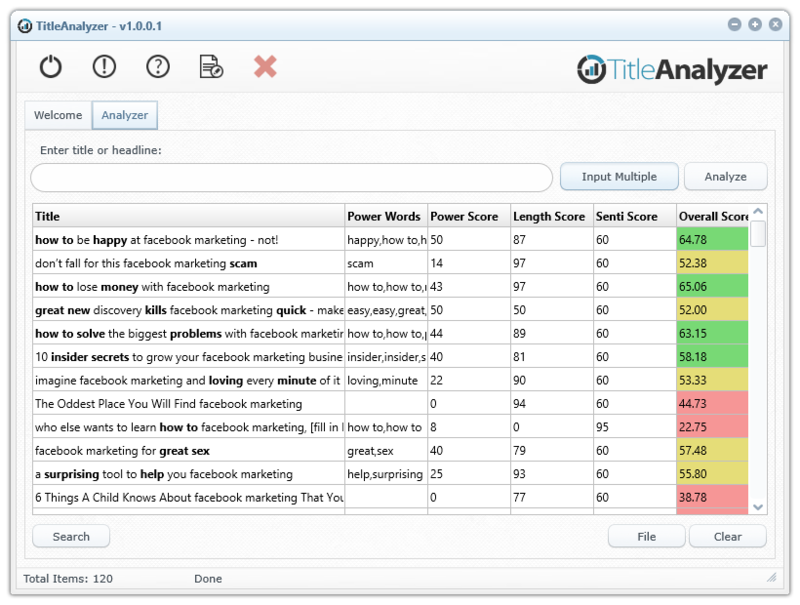 Both the Fresh Title & Title Analyzer software will work on Mac OSX 10.8 or higher, and Windows XP, 7, 8, & 10. NOTE: The PC version currently doesn't work on Windows Vista.